Traditional, blue-chip stocks and FANG just aren't cutting it right now. Smart investors will consider alternative strategies to diversify out of the same-old, same-old. Blue-chip stocks like Boeing (BA - Get Report) have reigned supreme on Wall Street for generations. The tech complex known as FANG has held court among growth names for nearly a decade. And old-school consumer shares such as Walmart (WMT - Get Report) have always been a stalwart of the low-risk diversified portfolio, right? But those traditional investments aren't cutting it anymore. If you want to get the most out of this bull market, it's time to start considering alternative investments. Doing anything else would be just plain dumb. Consider the performance of some of those aforementioned traditional stocks recently. Facebook Inc. (FB - Get Report) , the shining star of FANG, had a rough start to the spring as data scandals rocked it (and its share price, too.). Apple Inc. (AAPL - Get Report) last week entered into correction territory on concerns of waning smartphone demand. The two have only narrowly outperformed the broader market of late. You attending TheStreet's May 5 "Investor Boot-Camp" conference? Why not? Learn more here. In the last year, shares of Dow constituents Walt Disney Co. (DIS - Get Report) are down more than 11%, Procter & Gamble Co. (PG - Get Report) is down more than 18% and International Business Machines Corp. (IBM - Get Report) have plunged 10%. As for old-school consumer staples, look no further than PepsiCo Inc. (PEP - Get Report) to spot the lack of investor enthusiasm. Its first-quarter earnings were certainly nothing to write home about, indicative of stale growth prospects in U.S. markets. Plus, PepsiCo's stock is lower by more than 13% year-to-date. So what alternative investments would boost a portfolio suffering from springtime melancholy? Cannabis and crypto of course, which have rapidly become the all-stars of alternative investing. "People are getting more comfortable with the risk profile of cannabis," said Keegan Peterson, CEO of cannabis-focused workforce management firm Wurk. "Everyone ... is going to want to be a part of this." Are you invested in cannabis? Why not? 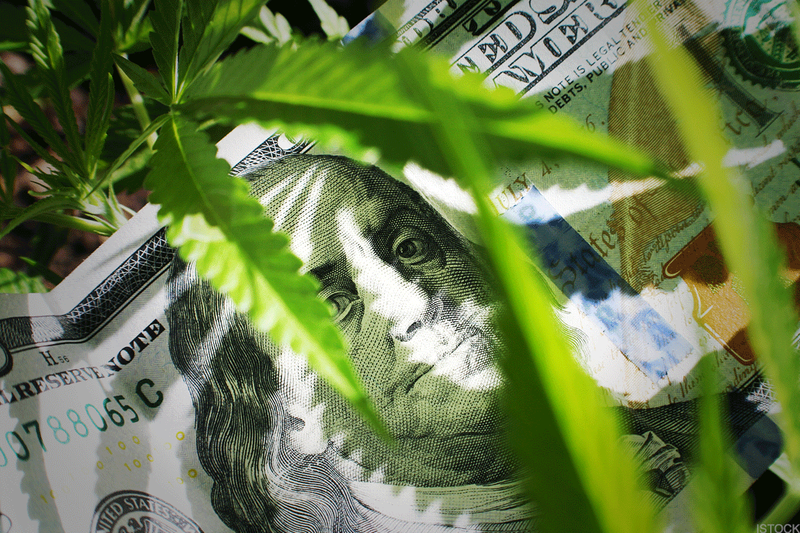 The international cannabis industry is worth about $7.7 billion now and is expected to grow to as much as $30 billion by 2021. "This is a train that is not going to be stopped," said Tim McGraw, CEO of cannabis-zoned real estate development firm Canna-Hub. To ride the budding cannabis industry, one might consider investing in pot stocks such as Benchmark Botanics Inc. (BHHKF , up 10% year-to-date, South American cannabis producer and distributor ICC Labs Inc. (ICCLF up 26% or Australian medical weed cultivator AusCann Group Holdings (ACNNF up 75%. Reminder: these are incredibly risky stocks given the nascent states of their operations and the cannabis industry. And then there are cryptocurrencies, the new-wave investment that has promised to change finance for the better. While the possibilities of the underlying blockchain technology are nearly endless, the digital assets themselves also represent significant opportunity since prices are well off their 2017 record highs. Investing in crypto can help diversify a portfolio, as digital assets are tethered to very few economic and market-moving indicators. A hot jobs report or a Fed rate hike could throttle traditional stocks, but that kind of news rarely affects crypto. That's good news for a portfolio. Plus, institutional investors have begun to pore in, which is set to "have an incredible impact on price and liquidity in a positive way," said Bill Barhydt, CEO of crypto exchange platform Abra. Just last week, white-glove bank Goldman Sachs Inc. (GS - Get Report) made its first official cryptocurrency department hire. Similar to cannabis stocks, well-known crypto plays such as Nvidia (NVDA - Get Report) have out-sized risk as the digital asset space is highly unproven and often volatile. A well-rounded investor has some of the classic names in the portfolio, but he or she doesn't rely solely on those stocks to get through every up and down in the market. Exposing your portfolio to some crypto and cannabis plays can represent an enormous opportunity for growth in two spaces ripe for it. Don't be dumb -- consider something outside the norm once in a while. Facebook, Apple, PepsiCo, Nvidia and Goldman Sachs are holdings in Jim Cramer's Action Alerts PLUS Charitable Trust Portfolio . Want to be alerted before Jim Cramer buys or sells the stocks? Learn more now.